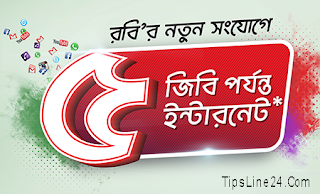 Robi lunched their new coonection offer. With every Robi new prepaid connection you can enjoy free SMS, Lowest Call rates and up to 5GB discounted internet data. 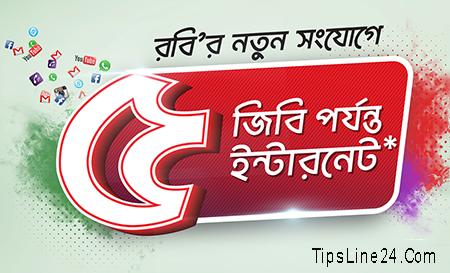 In this offer you can enjoy 1GB of Internet @ 9Tk After 34Tk first-time easyload recharge. In order to be eligible for the 1GB @ 9Tk internet packs, 34Tk FIRST-TIME RECHARGE is a must. First-time recharge means NO previous recharge history available. If a user has availed a 1 GB internet pack, then in every calendar day he will be able to use 250 MB in regular speed and then his usage will take place from the assigned pack in a throttled speed (128 kbps). Regular speed will resume from 00:00 hours of the next calendar day. With every new Robi prepaid connection, now you can enjoy up to 5 GB of Discounted Internet. Free VAS services will be activated within 72 hrs after 34 tk first recharge within 7 days of activation (Tk. 34 FIRST-TIME RECHARGE is a must). Migration-in to this new package is NOT allowed. And migration-out from this new package is allowed. On migrating out to other Robi packages, the customer will carry the existing data pack (if any).